A winter sunrise in Holmes Co., OH. I’m a sunrise junkie. Spending most of my life in bucolic Holmes County, Ohio hooked me. Sunsets can be gorgeous, too, but there is just something special about watching the blackness of night slowly transform into an explosion of shimmering radiance. Sunrises usher in a new day, every day. No two are alike. 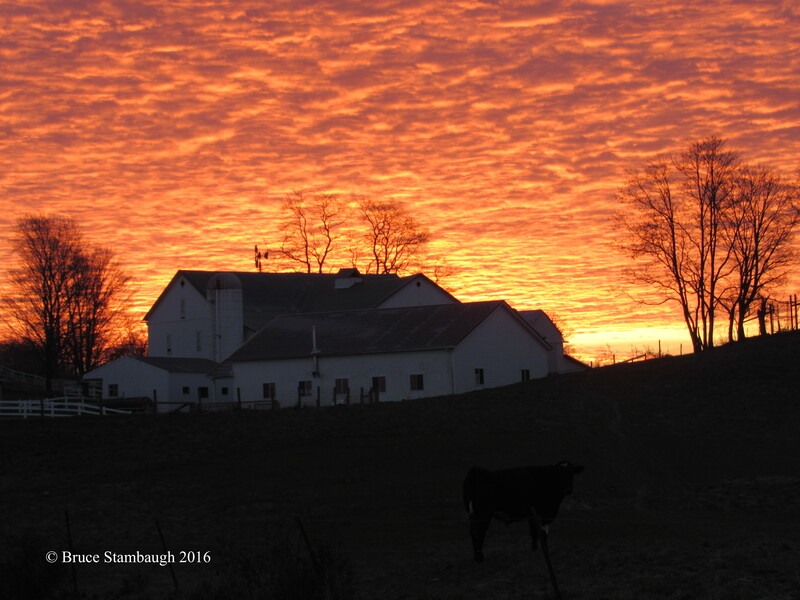 Sunrises paint the horizon in majesty, no artificial coloring, chemicals, or preservatives added. Mornings can be brilliant, sometimes dull, and often obscured by clouds or our personal negligence. Nevertheless, sunrises persist. Sunrises are free. They literally edify people, whether they realize it or not. I’ll admit that I didn’t fully appreciate the power and gift of a peaceful, awe-inspiring sunrise. Living in pastoral Holmes County quickly instilled a resounding admiration for the daily occurrence. The rural settings east and west accounted for that. Sunrises, however, enhanced those inspiring countryside scenes. I thrilled at watching a winter’s dawn filter through the little woods behind our Killbuck home. Yesterday’s snow morphed from white to pink to purple and back to fields of sparkling diamonds in a matter of minutes. That silent, reverent beauty astounded me, readied me for the day ahead, and fortified me to proceed with whatever I encountered. Naturally, some days were better than others. If I remembered the sunrise, my burden often lightened enough to sustain me. That existentialism increased along with my responsibilities when I became an administrator, and we moved to East Holmes. 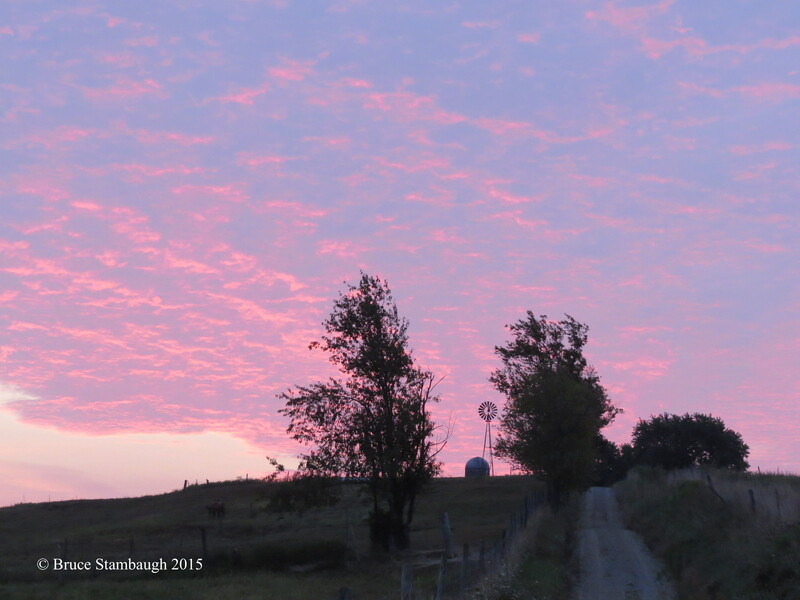 Our home was built on an Amish farm with incredible views east, north, and west. Spectacular sunrises made them more so. I rose each day to arrive at school by 7 a.m. More often than not, a sunrise greeted me on my way. In the winter, the sun appeared as the young scholars arrived. The already rosy-cheeked faces became even more so. Likely, I am romanticizing those long ago moments. No matter. Like the rising sun’s universal effect, the memories whitewash the darker times of anyone’s career that involves daily interacting with people of various ages, traditions, and beliefs. That doesn’t negate nor diminish the recollections. For something so brief, sunrises serve as powerful reminders of what was, is, and can be. It’s up to the eye of the beholder to discern and employ the light’s soothing warmth with all those we encounter through justice, mercy, and humility. That’s the potential of a single sunrise. I found it ironic then that all these ardent thoughts tumbled through my mind like crashing waves as dazzling daylight washed over the Atlantic Ocean. That’s the mysterious point of life’s cosmic magic, isn’t it? At first, a hint of paleness divided the dark sky from the sea as billions of celestial jewels sparkled in the heavens above. Soon a thin orange line stretched clear across the distant horizon. Cottony clouds sprinkled high and low caught invisible rays and turned them into a surreal light show that out shown any Disney artificial production. Black skimmers winged by, flying silhouettes scooping their fishy breakfast from the salt water surface. Forster’s terns hovered, dived, and plopped into the sea for theirs, briefly breaking the glassy waters. Everything, the sand, the water, the sky turned some shade of purple, lavender, and then pink, orange, and red. I stood frozen and silent on the shore. Awed, I observed, appreciated, absorbed, and offered unspoken words of praise. My school days have long since passed. Yet, another day was at hand. With each sunrise, I aspire to share the light with anyone anytime I can. I hope sunrises do the same for you.